Russia has launched a military partnership project with its Cold War ally Cuba, amid rising tensions over US plans to deploy an anti-missile system in Europe. Russian contractors are to supply production equipment for manufacturing 7.62-mm rifle rounds, Kommersant daily reports. Cuban arms plant called Comandante Ernesto Che Guevara will also receive a license and technology for recycling used ammo. The daily cites its sources as saying that Havana officials decided to purchase the equipment after visiting a similar production line in Venezuela. The insider did not reveal any details on the financial terms of the future deal, but said it was close to being sealed. Russian arms producers further hope to win a contract for upgrading the whole ammunition plant in the future. It was built in late 1970s early 1980s with the help of Soviet specialists. The United States are maintaining a decades-old trade blockade of Cuba. Russian companies, which would supply military equipment there, risk sanctions by the US. 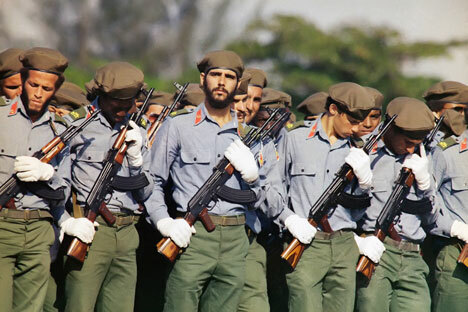 Communist Cuba was a major ally of the Soviet Union during the Cold War era, with an estimated gross value of arms supplied to Havana reaching $16 billion. The USSR delivered tanks, Mig fighter jets, helicopters, rocket air defense systems, submarines, small arms, communication equipment among other things. The close military collaboration resulted in the most serious tension of the period, when Moscow deployed its missiles on the island in response to a similar move by the US in Turkey. The collapse of the USSR and the economic perils new Russia faced weakened its trade and military ties with Cuba. In 2001 Russia shut down the radio reconnaissance base in Cuba, the last of its military facilities there. However in the late 2000s Moscow and Havana began to re-establish relations on many levels. In September 2008 two Russian strategic bombers carrying top Air Forces brass visited Venezuela. The aviation generals also visited Cuba and later voiced possible plans for renting and upgrading an air base on the La Orchila Island, which would allow Russian military aircraft patrol the Caribbean. Also in 2008, Russian Army generals visited Cuba to inspect its air defense forces. Possible upgrade of the old equipment and supply of spare parts was on the table. The moves were viewed by many observers as Russian response to the Bush administration plans to deploy an anti-ballistic missile system in Europe. The news on the upcoming round production deal comes as Moscow and Washington are reaching new heights of tension over AMD system. The US refuses to provide guaranties that the system would not be used against Russia. Russia’s latest move in the row was to open a new early warning radar in its western exclave, the Kaliningrad Region. President Medvedev has also threatened deployment of short-range ballistic missiles capable of destroying American ABM facilities, should it be required. Vladimir Anokhin, the vice president of the Academy of Geopolitical Problems, does not believe that signing the military contract with Cuba is some kind of Russian geopolitical answer to US plans to deploy an anti-ballistic missile system in Europe. “This is a common business deal by Rosoboronexport,” Anokhin told RT. Anokhin however noted that Cuba has always been in Russia’s “area of interest” and said that at this moment no one can hamper the improvement of Russia-Cuba military cooperation.